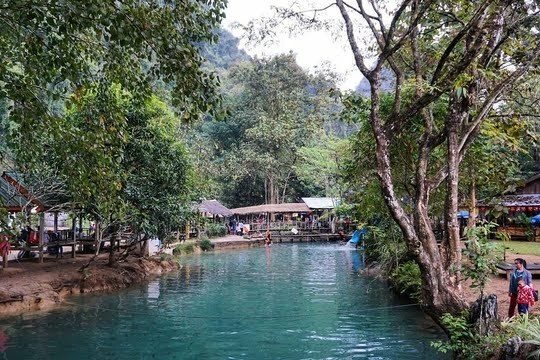 Oftentimes dubbed as the epitome of picturesque natural landscapes in the Laotian countryside, Vang Vieng is home to numerous natural attractions and phenomena that offer a stark contrast against the party atmosphere in the town centre. Rice paddy fields welcome you as you begin your westward journey. Even though the route out into the wilderness is not easy and may be rather exhausting, the effort is definitely worthwhile when travellers are treated to a visual feast of the limestone karsts blending with the green rice paddy fields to form one of nature’s most beautiful masterpieces. Can it really get any better than this? 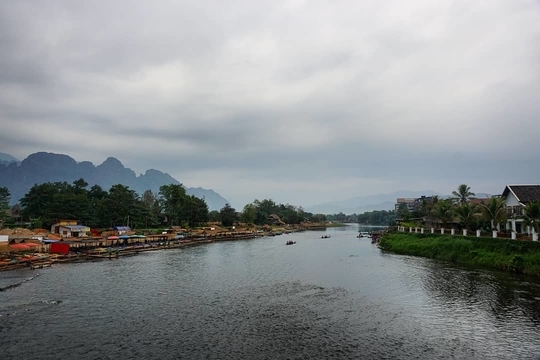 Heading out from the town centre of Vang Vieng towards the Nam Song River which will surely by now evoke memories of their lovely tubing experience, visitors will arrive at a toll bridge which connects the town with the opposite riverbank. We were greeted by this intricate Buddha sculpture before heading out to the opposite riverbank. The toll fees differs for travellers based on the mode of transport they cross the bridge with – LAK 4,000 for pedestrians, LAK 6,000 for those riding a bicycle and LAK 10,000 for motorcyclists. There have been online reviews written about free bridges to cross the river on, but the toll fees were relatively inexpensive and affordable so why not just help the local economy? Nam Song River seems to be gushing at rapid paces - glad I'm not tubing today! 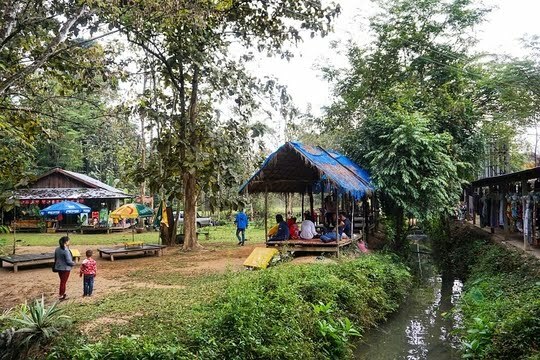 After traipsing over the bridge and crossing the Nam Song, travellers will have the opportunity to learn more about the livelihood of the locals in a typical village. The village already looks so different from the town centre of Vang Vieng. Visitors will also be able to view how the local populace live in their humble abodes constructed out of simple materials such as wood. I'm glad we didn't have to walk on that muddy road which would've killed our shoes. 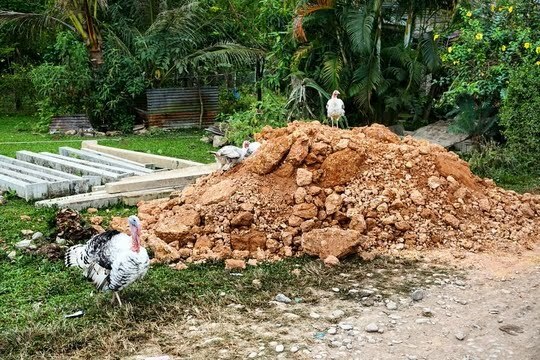 Farm animals such as cattle and fowl including turkeys and chickens can also be found trampling all over the dirt roads in this little village. Cattle enjoying their daily fix of grass as they walk past me shyly. 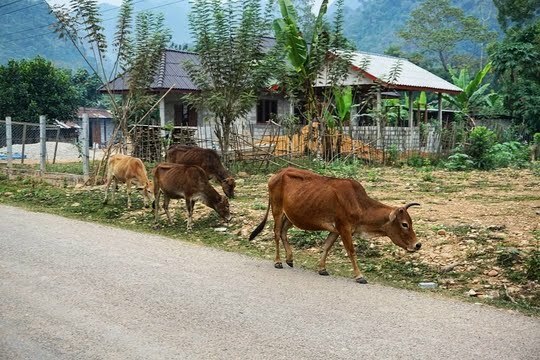 Visitors who live in big cities will definitely have a unique experience getting up close with these adorable creatures on their way heading out into the wilderness to explore Vang Vieng’s star attractions. This is the first time I've ever seen a turkey in real life - you can imagine how excited I was! 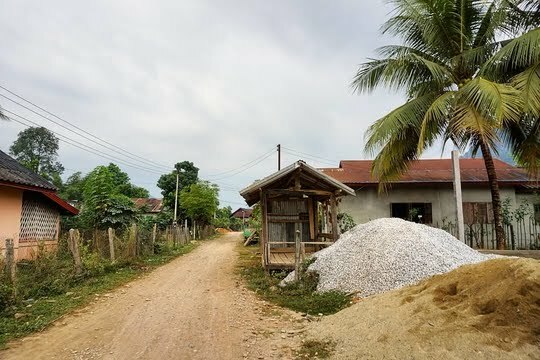 The village will soon give way to a seemingly well-cemented path flanked by rice paddy fields cared for by local farmers. I wonder what that little hut is - anyway, it has quite a view! Here, tourists can begin to admire the spectacular mountainous landscapes starting to form up and unravel right before their very eyes. Guys, look - the mountains are appearing! As the mountains begin to appear larger and more impressive than the previous ones, visitors will indulge in a uniquely tranquil, serene atmosphere that seems to loom over the entire area. The clouds further add to the mysterious vibe of the mountains! The path towards the major attractions is oftentimes alternating between small local villages and agricultural plantations. And here I am in the middle of a local village in the mountains. This is testament to the harmonious interaction between the local populace and the natural setting and how well they blend together in this pristine environment of the countryside. That house is exactly what I need - a house with an awesome view! 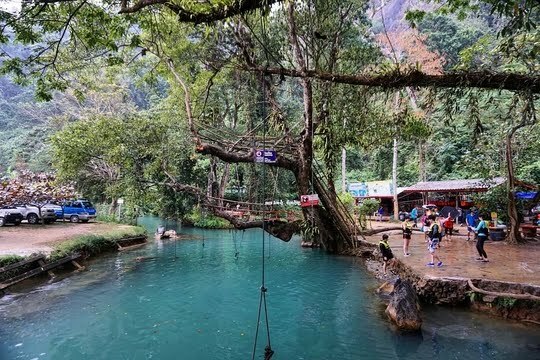 Oftentimes deemed as a must-do activity when travellers visit Vang Vieng, Blue Lagoon remains possibly the most-visited tourist attraction in this town with its beautiful blue waters flowing peacefully in the pool. That's blue right there, my friend. 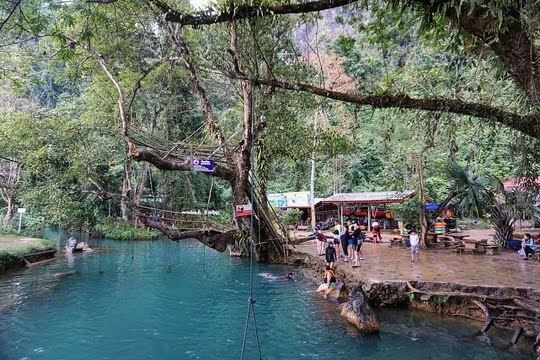 The lagoon derives its perfect shade of turquoise blue due to the rich deposits of a mineral called calcium carbonate and definitely gives travellers a good idea of what to expect at the majestic Kuang Si Falls in Luang Prabang that also has its blue waters glistening under the sunlight. Definitely come first thing in the morning to have the Blue Lagoon all to yourself! 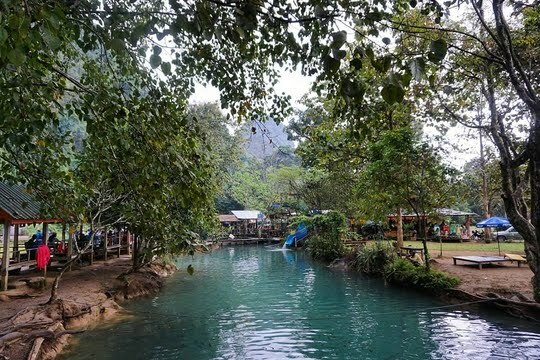 Travellers will have the opportunity to dip in the cooling waters to get refreshed and rejuvenated from the scorching Southeast Asian heat and the exhausting ride out into the wilderness from the town centre. Those cool, blue waters are just so alluring and tempting to get a dip in - aren't they? As the waters are also home to little fishes, visitors will be able to have a unique mix of swimming and scuba-diving by being able to swim alongside these creatures in the calm waters of the Blue Lagoon. They should definitely release the massage fishes into the Blue Lagoon - that'll be a great gimmick! In addition, other facilities such as water slides are available for tourists to just immerse themselves in the fun-loving atmosphere of the place, even though a one-time payment is required. That water slide sits quietly at a side and beckons tourists to give it a shot. As for the adrenaline junkies out there who are always looking out for the most exciting things to do, they will be easily satisfied by climbing up massive trees and jumping into the water from varying heights or hopping onto a rope swing from the shore to propel themselves into the water. Visitors can expect to have quite some time entertaining themselves in the water, be it by taking the plunge into the waters or simply people-watching and seeing other backpackers perform various antics to hop into the Blue Lagoon. Crowds of travellers on guided tours have formed up to watch their friends take the plunge. That Korean lady stood at the top for at least 15 minutes before finally jumping. 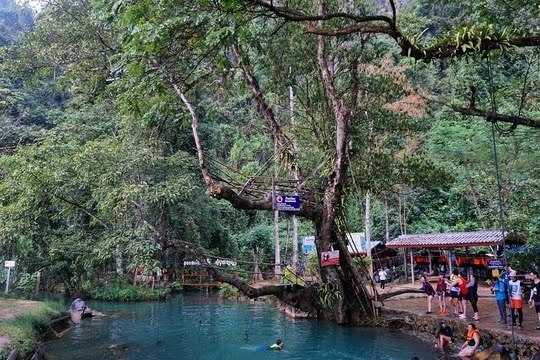 The Blue Lagoon is probably one of the last remaining relics reminiscent of Vang Vieng back in its heyday as a maniacal backpacker haven ravaged by drugs and alcohol. Albeit a much more peaceful one, thankfully! 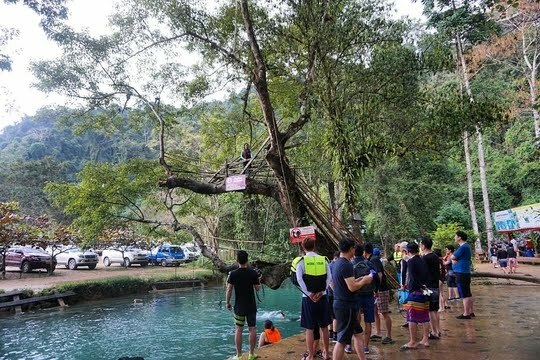 The scene can potentially allow tourists to vividly visualise how the Nam Song River must have been with drunken tourists leaping off trees into the river and getting their fixes of booze every single day. There must've been hundreds of these swings along the Nam Song back in the day. It is not difficult to see how this must have adversely affected the livelihood of the locals and the atmosphere of the town that must have experienced a cultural shock upon witnessing the influx of tourists from all over the world. The place can also get packed with tourists who have signed up with package tours from their hostels that will not fail to dampen the mood by causing long waiting times on the facilities and swimming in an overcrowded pool that takes its charm away. It was a rainy day so the crowds were not so crazy as they could potentially be in hot, sunny days. As a result, if visitors have an appropriate mode of transport (an ATV buggy will be fancy) or are willing to brave an exhausting ride further out (in addition to the return journey back to the town), I would recommend that they consider heading out to Blue Lagoon 2 or Blue Lagoon 3 instead. Yeah, you heard me right - they love Blue Lagoons here in Laos. There, they will be treated to a much more massive blue lagoon with that same lovely shade of turquoise but considerably smaller crowds and loads more fun having the entire place to themselves. Having one of those automobiles out there will come in handy as well. 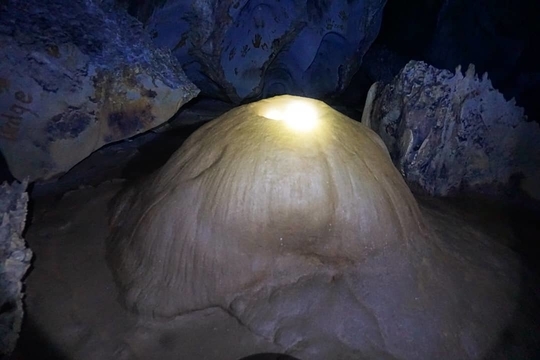 For visitors who found the Blue Lagoon unappealing like me, they will definitely not be disappointed with the Tham Phu Kham Cave (which means the Cave of the Golden Crab). Just check out these amazing stone structures all over the cave! 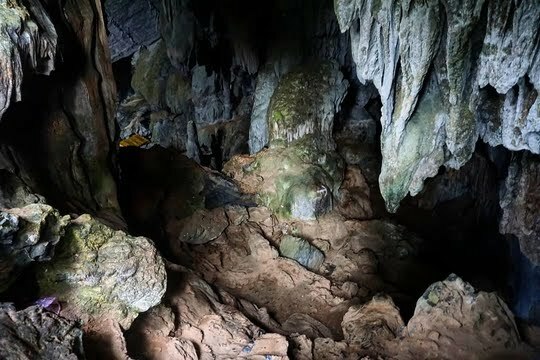 Visitors may have the opportunity to spot golden crabs emerging in this cave if they are lucky enough. I didn't manage to see any golden crabs, but these intriguing formations made up for it! This cave is not only popular with backpacking tourists who have come to visit it together with the Blue Lagoon, but also is very well revered and respected by the locals. The cave entrance may look unimpressive, but there's much more than meets the eye. 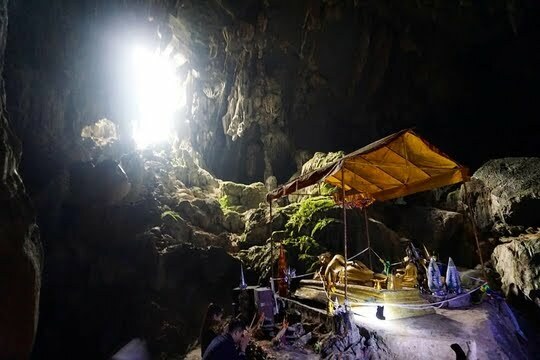 Many locals actually come forward to the cave to pay their respects and make their offerings at the location which they consider as sacred and holy. There is a tranquil, peaceful aura that seems to cover the caves with these magical formations. As a result, it is highly recommended that travellers visit and enter the cave in respectable attire before heading out to the Blue Lagoon in their swimwear. It's cold here in the cave as well, so you'll probably want to cover up. 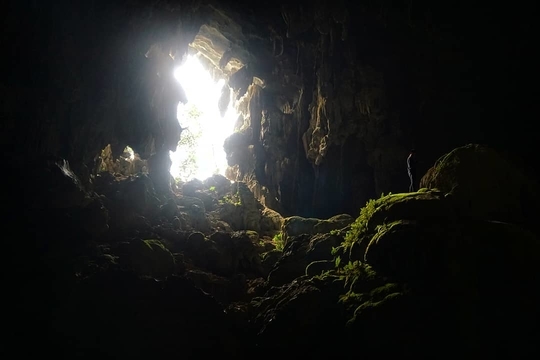 After heading up a steep ascent up a 200-metre hiking trail just behind the lagoon, visitors will be treated to an intriguing cave that vaguely resembles a labyrinth comprising numerous chambers and galleries. That's right, it's quite a steep climb up to the cave from the lagoon! 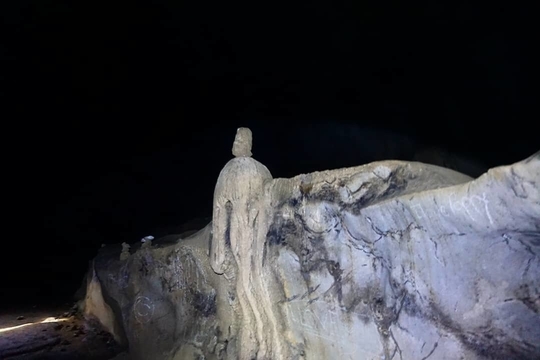 The main highlight in the entire cave will be the bronze Thai Buddha statue that lies in a reclining position on a pedestal and is illuminated by the natural light shining into the cave through a hole. The Buddha statue attracts masses of locals to head to the caves to perform their rituals. Travellers will have the opportunity to observe the locals as they perform their religious rites and also marvel at the beautiful sight where the light just falls perfectly on the structure of the Buddha. Natural light from outside the cave gently lights up the area surrounding the Buddha statue. 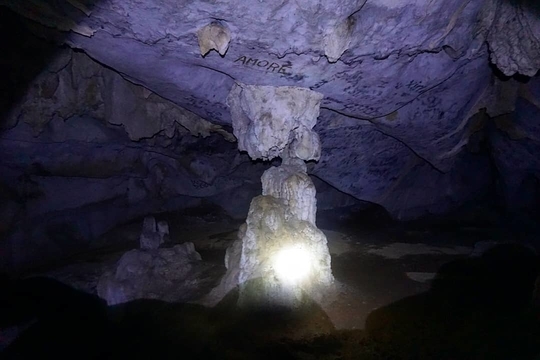 There is even a stone pillar set up in the middle of the cave where the local people stack three pebbles on top of one another as they believe that it brings them good luck, so tourists may wish to participate in this interesting practice as well. Tourists and locals alike have formed piles of pebbles stacked on top of one another. 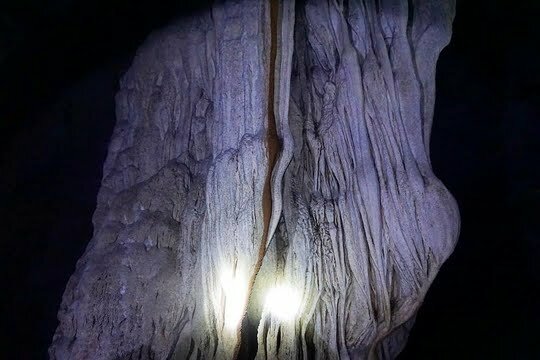 The various chambers all over the cave are adorned by beautiful stalactites and stalagmites of various sizes and shapes that promise to impress travellers. 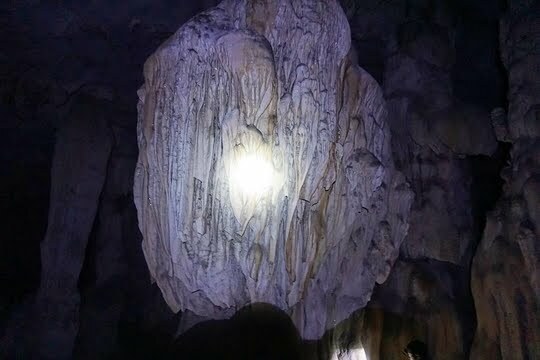 That just looks like a massive chandelier hanging precariously on the ceiling of the cave. 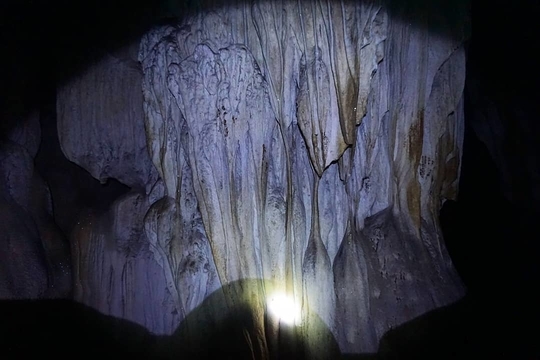 In addition, visitors will be treated to a plethora of intriguing natural phenomenon such as the ceiling of the interior dotted with condensation on various stalactites which resemble a night sky scattered with stars. These water droplets are on their way to form more stalactites crawling down from the ceiling. Intriguing stone structures can be found throughout the entire cave and allow tourists to imaginatively visualise and think what these stone figures may resemble. That structure definitely looks like a person emerging from the rocks - how amazing is that! 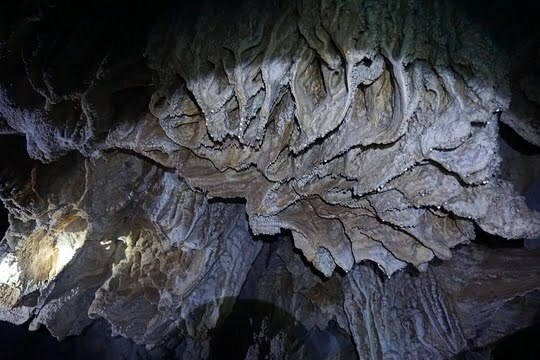 Results of a rock-fall can be seen at the midway of the cave, reminding us that the formation of these magnificent structures is a result of the culmination of ages of natural phenomena. Just take a look at those massive rock slabs stacked on top of one another! This is just like how each of these massive stalactites and stalagmites must have existed for millennia to allow us to marvel at this cave today. Does anyone else think these look like ginseng? Sadly, there have been quite a few blatant acts of vandalism where people have scribbled words on the rocks and left their handprints all over that greatly undermine the beauty of the entire place. It's so ironic that they're destroying the places they travelled so far to visit. 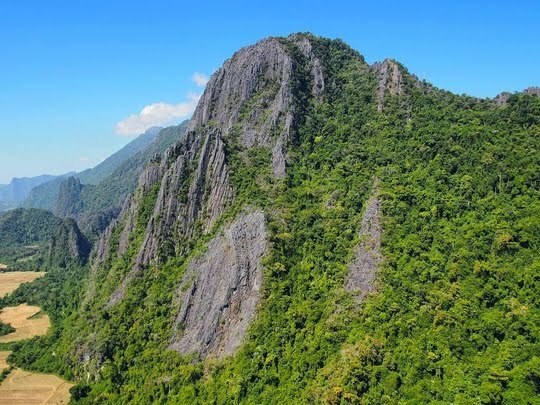 Hopefully, we will be able to work towards the goal of conservation of these natural wonders through sustainable tourism so as to prevent such incidences from happening (especially in this holy site for the locals in Vang Vieng). A pillar forming - but the ceiling has already been vandalised by inconsiderate visitors. 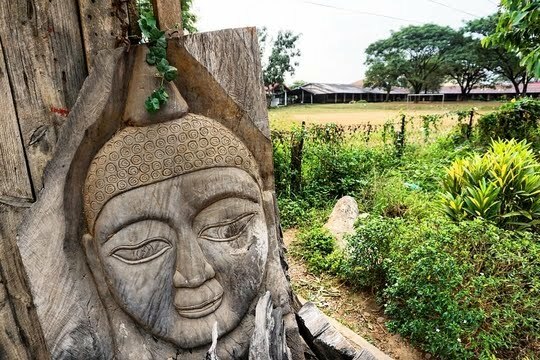 The authentic travel experience unique to Laos is once again seen here where tourist attractions are left and preserved in their raw, untouched states instead of being excessively pre-packaged and commercialised. This looks like the roots of trees growing in the wrong direction. 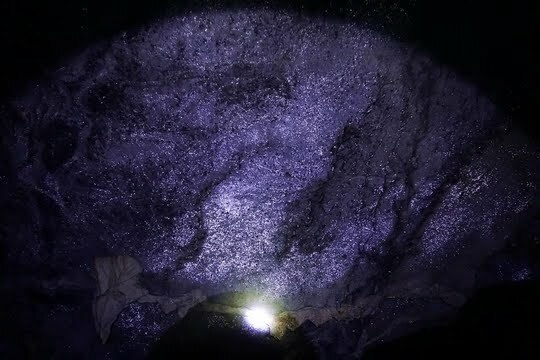 The cave is interior pitch-black and solely illuminated by the light from the travellers’ headlamps. And it doesn't help with these sharp rock edges all over. 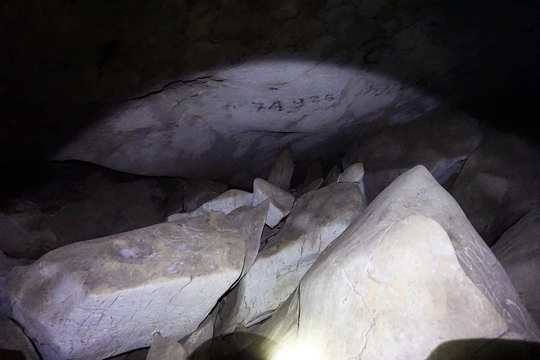 This is further aggravated by the fact that there is no designated path inside the cave which means that tourists have to figure their way around the jagged rocks and ascertain the way they are going to traverse whilst moving along in the cave. Those plants don't make climbing into the cave any easier - trust me. This is extremely hard as some rocks may not offer stable landing points and the rocks are very slippery from the condensation that forms on the surface. See how wet the ceiling is? The ground is equally wet. I would highly recommend that visitors hire a guide to guarantee their safety as these experts can pinpoint specific steps to take when in the cave to avoid any mishaps. I didn't have to worry when I was busy taking photos, thanks to my guide. I am definitely grateful that I hired a guide because I would definitely not have been confident enough to make my way through the dark on the slippery grounds and would have most probably turned back much earlier to return to the light. I would've missed out on so many sights if I hadn't gotten a guide. That reminds me of Azerbaijani mud volcanoes. 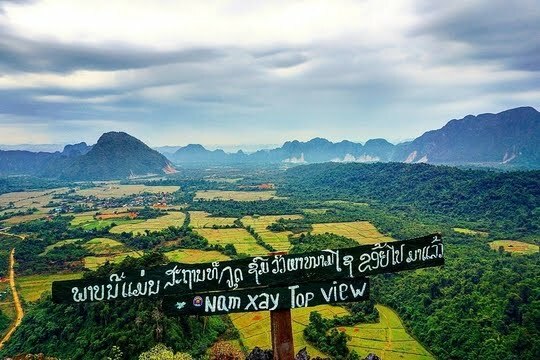 The most famous vantage point in the entire of Vang Vieng, Pha Ngeun Viewpoint is the tallest hill in the area that naturally offers travellers fantastic 360° views of the entire landscape dotted with rice paddies and agricultural plantations with limestone karsts erected all over the area. The rice paddies and limestone karsts already look so amazing at ground level - just imagine how a bird's eye view must be like! The foliage must be as thick as this 'jungle' I saw on my way to the Blue Lagoon. 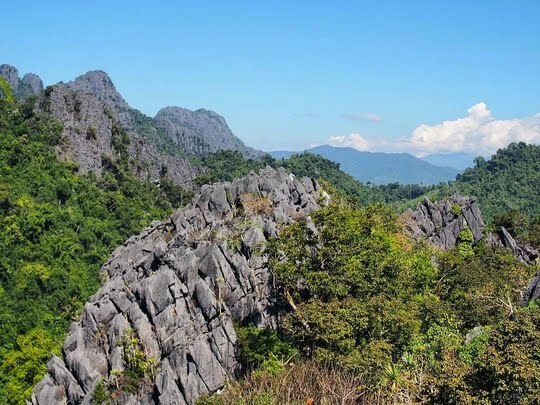 The viewpoint that is the nearest to the town centre (at only about 3 kilometres away from the town), Pha Ngeun is definitely one of the favourites amongst tourists who are able to reach it even on foot. 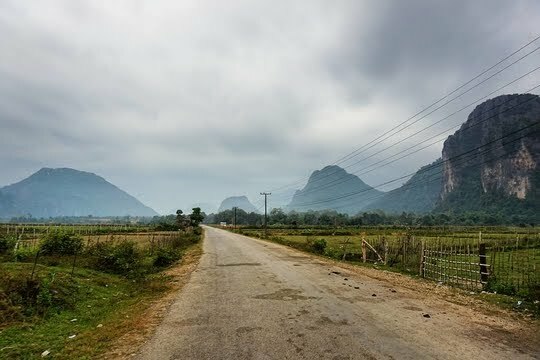 It's another epic and scenic walk out to Pha Ngeun from Vang Vieng. The viewpoint has also been greatly publicised and advertised by various accommodation options who strongly recommend that visitors head down to Pha Ngeun to enjoy the magnificent views. 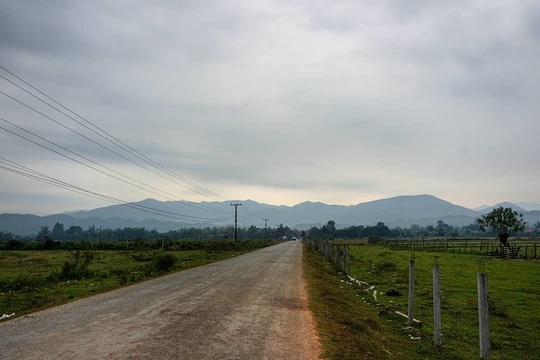 Even the road out to Pha Ngeun is scenic! Colloquially known as the Sunset Hill amongst backpackers, this scenic viewpoint attracts massive hordes of tourists who try to capture the most epic shots of the sun setting amidst the hilly landscape and disappearing amongst the mountains. Just a short distance outside of Vang Vieng and you'll be treated with this view! Sitting in the humble village of Phone Ngeun, visitors will be able to start off with a taste of local life by interacting with some of the locals before heading onward to their ascent of the hill. The path up to the peak has drawn mixed reactions from various travellers, but most agree that it started off being a very gentle climb that gradually became more vertical. 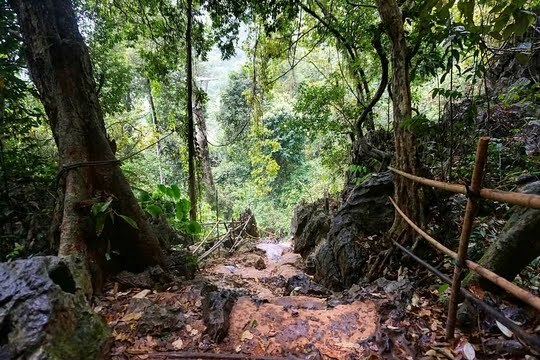 However, the villagers have actually constructed miniature wooden steps as well as ladders over the most difficult parts of the ascents, thereby making it much simpler for travellers to stroll up this hill. The mountainous landscapes surrounding Pha Ngeun are incredible and worth the climb. The entire hike up should take half an hour thereabouts and the visitors’ efforts will be greatly rewarded by an extraordinary view of the whole region just sitting right below. The first thing that catches your attention will be this massive mountain just opposite Pha Ngeun. Travellers should continue moving on after reaching the first observation deck which only offers an average view that will be dwarfed by the amazing sights from the second little hut that sits dangerously on the cliffs. It is no wonder that Pha Ngeun earned its reputation as the Silver Cliffs. The sunset view seems to whisper, "Welcome to Vang Vieng." Vang Vieng is an absolutely amazing destination that has something for everyone! If you have a weak spot for spectacular landscapes, stay tuned as I reveal the secret viewpoint that has the most amazing views and still remains one of the town’s best-kept secrets that is not on the radar in Google Maps and which even locals are unaware about. Are you inspired to visit Vang Vieng after reading this post? If so, please feel free to check out the affordable flight options which have been made available by Skyscanner in the link below. Download the Skyscanner app on your mobile device to have a one-stop station to compare airfares from the various airlines available! It also offers car rental, travel agent and accommodation in various travel destinations including Laos. Some of the links above are affiliate links, which means that I will earn a commission if you click through and make a booking at no extra cost for you. Thank you for your support! Ohhh how sad to see the vandalism on the limestones! This show of how much "kids" travel who shouldnt be traveling! And I was shock of how much is build around the blue lagoon! In 2011 there was nothing around except the river! How I wish to go back to Vang Vieng just to climb that Silver cliffs for the sunsets because we didnt know about this in 2011! 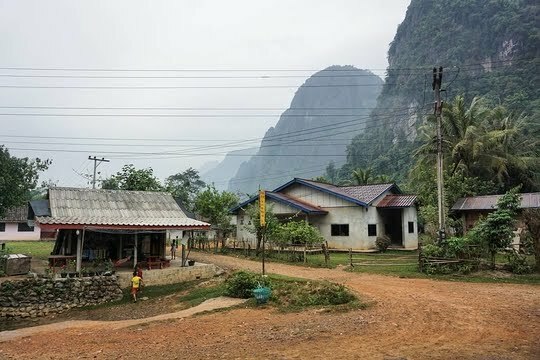 Hey there, it's definitely interesting to hear about how much things have changed here in Vang Vieng, even though it all still seems rather rustic and untouched to a first-time visitor. I guess more tourists are scouting for new, unknown vantage points which potentially may have catapulted Pha Ngeun (Silver Cliffs) to become a popular viewpoint amongst travellers. I'm sure you'll enjoy yourselves tremendously when you are able to take in those spectacular views of the rice paddies and the limestone karsts from a different angle. Indeed, it's a disappointing and depressing sight to see how some tourists have totally paid no heed or respect to these attractions. The sheer fact that it is a holy site revered by the locals, just like any other temple or shrine in the country, just further accentuates how irresponsible and inconsiderate they are. I just find it terribly ironic that they are destroying the very places and attractions they travelled miles to catch a glimpse of. Nevertheless, I'm hoping this is a minority of the tourist population, as many visitors treated the caves respectfully which is great to see. As I have a massive weak spot for natural landscapes and adventure, everything here sounds right up my street. I want to do it all! 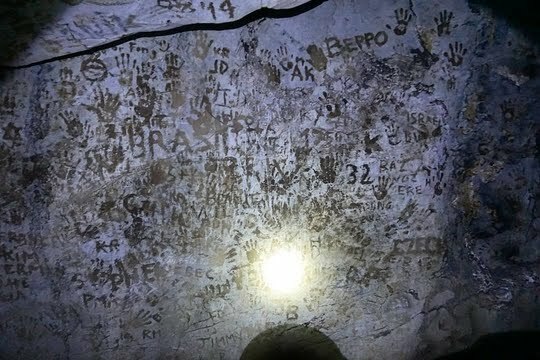 I have to say, I think the graffiti on the cave is disrespectful to the locals who view it as a holy spot, and I don't condone it. BUT, there's something very Lascaux-caves about people putting their names and handprints on the cave walls. Maybe not the best idea now, but in 5,000 years, if the caves are still there they may be a marvel then! But the landscape here looks absolutely beautiful - lush green forest, limestone crags, lagoons... what more could you ask for. Same here, Chesca! 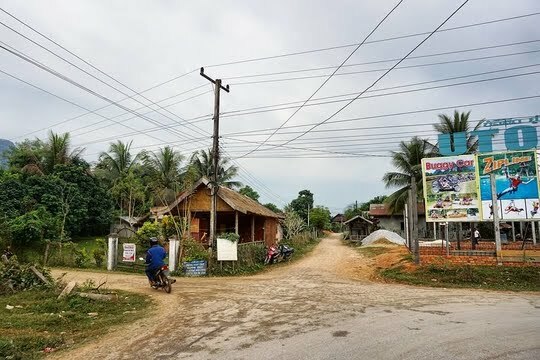 Even though I do enjoy walking around and getting lost in big cities while exploring the various attractions available, I just love being able to admire the picturesque natural landscapes all around with massive limestone karsts towering over the area dotted with agricultural plantations, rice paddy fields and lush greenery. The immense number of vantage points and viewpoints rising above the lands offer travellers a unique bird's eye view of the area from varying angles, which definitely spoiled photography buffs like me. I'm sure you'll love it there as well. That's quite an interesting perspective you have shared here, and it's the first time which I have heard of the Lascaux Caves. I guess it will probably be quite amazing in the future just like how the hieroglyphs and wall carvings we see in ancient sites shed some light on how the people lived back in the olden ages. 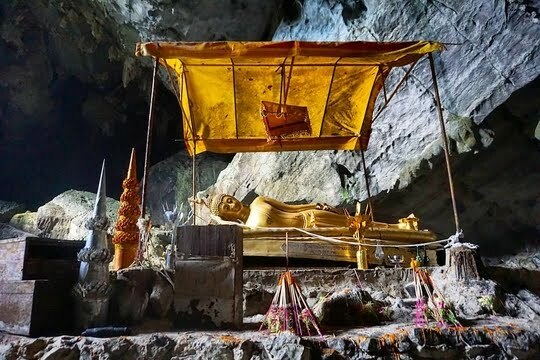 Nevertheless, it's really sad that the tourists are totally disrespecting the sanctity of the caves which the locals treat with utmost respect and reverence. Thanks for sharing this alternative viewpoint though! This is an excellent post on this area, especially for me as I've never been here (yet!). That cave with the buddha is spectacular. I think I read about it before and always said I wanted to see it one day. This is truly a beautiful landscape and scenery. So authentic and rustic too. Hey Lisa, if you read about a cave with Buddha images, there's a pretty high chance that it is talking about the renowned Pak Ou Caves located in Luang Prabang which we will be exploring in a subsequent post, as numerous locals head there in a pilgrimage of sorts to do their prayers and make their offerings. It's definitely an interesting travel destination with a peaceful, tranquil vibe that I will be sharing more subsequently. 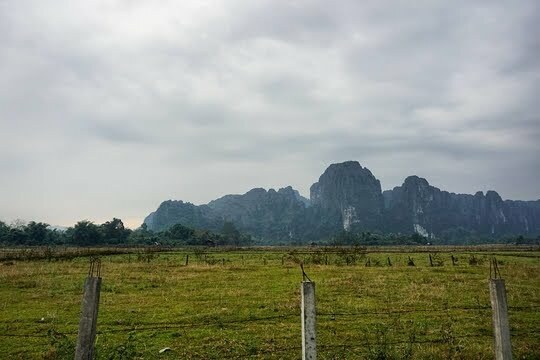 Vang Vieng is indeed blessed with amazing natural landscapes - limestone karsts emerging from the grounds in every direction that one looks in, as well as endless rice paddy fields and lush greenery dotting the entire area. Many tourists are put off by the excessive party atmosphere perpetuated by the backpackers in the main town centre, but it is definitely worth the stop in this town because there's just so much nature and numerous outdoor activities to embark on - including hiking - that one can enjoy just minutes outside of the town. 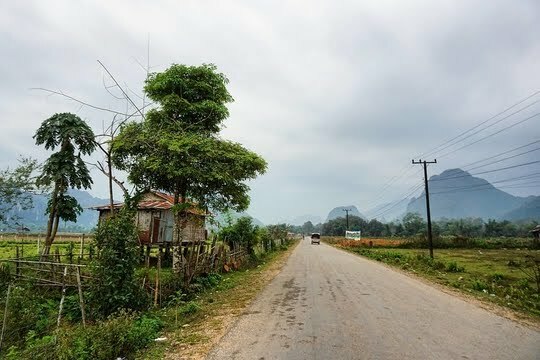 The landscape around Vang Vieng, particularly the villages seem idyllic and peaceful. I really enjoyed the photos of the blue lagoons as well- that tip about blue lagoon 2 & 3 will come in handy some day. The calcite formations in the cave look great as well. Hi Denny, if you are planning to hire an ATV buggy or somehow manage to land yourself a tuktuk driver for a day and wish to just relax and unwind, I would highly recommend that you head down Blue Lagoon 3 which is quite a distance away from the town centre. I have read numerous online reviews that travellers had the entire place to themselves and even had the opportunity to interact with some locals who were getting a dip in the cooling waters themselves. That's something that the Blue Lagoon will not be able to offer - since it's included in every single packaged tour offered in town and is much nearer to the town centre. It is really nice to get a feel of the countryside without all the party atmosphere and seeing backpackers everywhere one walks to in the town centre - and it just took a walk across the bridge to the opposite riverbank of the Nam Song to be able to experience just that. The little villages were really interesting and one really gets the chance to stop by huts, greet and share a conversation with the locals (they found it interesting to see me walking along the main road - probably wondering why I wasn't cycling, but that's another matter altogether). Hey Nathan, thanks for these tips. I've enjoyed visiting the villages of Laos, and the hospitality of the villagers when I was travelling across the country a few years back. However, that is something that I would continue to enjoy, no matter how many times I experience it. I haven't seen many photos of Laos before your post, so now I'm curious about exploring this country. That Buddha carving looks pretty cool. And I think we'd definitely stop at Pha Ngeun Viewpoint. Hi Marcie, it's really nice to hear that you're interested to visit this charming country after checking out this post of mine. 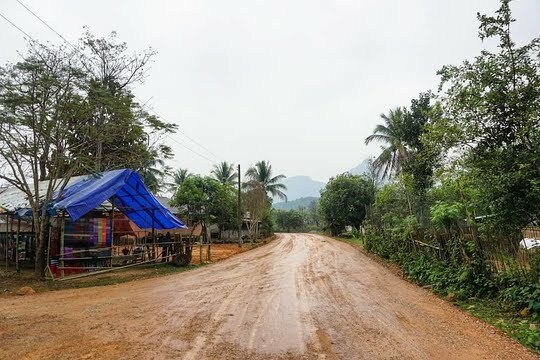 Laos is oftentimes neglected by backpackers who are visiting the region because it lacks the stereotypical Southeast Asian beaches they long for. However, it boasts a plethora of beautiful natural landscapes, a rich history and culture, friendly locals and a truly authentic travel experience where attractions are retained in their primitive, rustic form. I'm sure you'll enjoy yourselves tremendously in this country and bring back lots of memories. There are multitudes of viewpoints and vantage points which are sprouting up along the main road leading to the major attractions of the Blue Lagoon, most of which are family-owned and set up by local families who are capitalising on this magnificent landscape. Not only do tourists get the opportunity to admire amazing views of the entire area, they are able to support the locals too, effectively killing two birds with one stone. 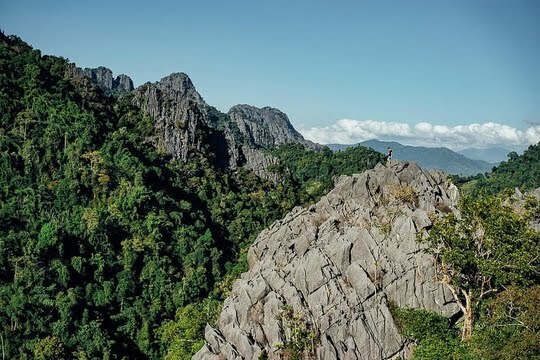 Pha Ngeun is the most famous and most accessible one of them all, but check out Namxay which truly has spectacular views in every single direction. What beautiful scenery. I would love to spend time exploring, then just relax in those blue lagoons. They just look so peaceful and refreshing. Hey Lois, the scenery here is absolutely spectacular with uncountable limestone karsts just emerging out of the lands which are dotted with agricultural plantations and rice paddy fields. Traversing the road to the Blue Lagoon not only opens up opportunities to take in these beautiful views but also allows for the chance to interact with locals who live in these villages along the way, so it's really a fantastic way to truly immerse oneself in the countryside vibe and enjoy Vang Vieng immensely. 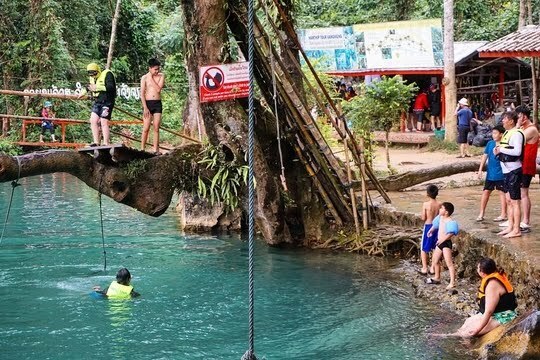 The Blue Lagoon is indeed a great way to unwind and relax after being fried in the scorching Southeast Asian heat, and also offers opportunities to befriend other backpackers while challenging oneself to jump off one of those tree branches and swings. If that's not for you, you can just enjoy a refreshing dip in the blue waters and just enjoy the mountainous scenery around the area. I'm sure you'll enjoy yourself tremendously here. 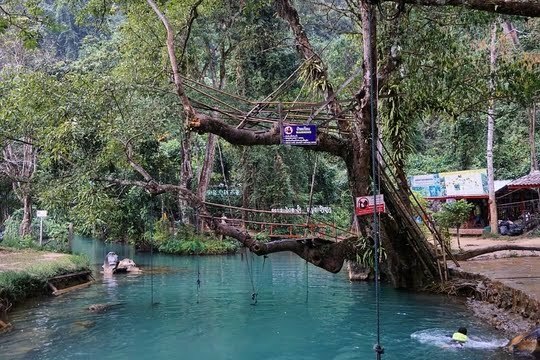 Wow, I never been in Laos, but this destination is on my bucket list. How many days you think is enough ? Hey there, Laos is quite a huge country and transport between cities can take a relatively long time even though you may not be covering much distance due to the relatively undeveloped transportation network. It also depends on which places you are planning to visit during your time in the country. For me, I travelled along the well-trodden backpacker circuit of Vientiane, Vang Vieng and Luang Prabang. 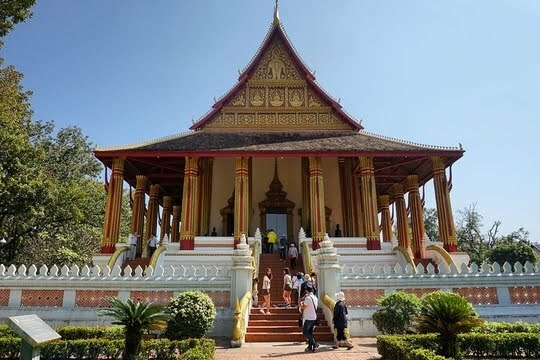 I would say 3 days each for Vientiane and Vang Vieng and 4 to 5 days to soak up the relaxed atmosphere of Luang Prabang where there is the potential for day trips to attractions such as the Kuang Si Falls and Pak Ou Caves. 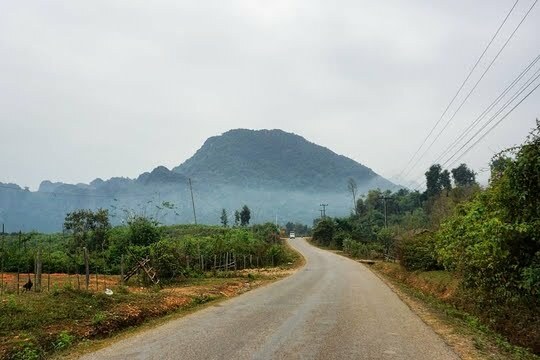 Other places you may wish to consider may include Xieng Khouang where there is the renowned Plain of Jars further up north and Don Det (4,000 Islands) down in the south where the scenery is said to be as beautiful as in Vang Vieng. As the connections to these cities are relatively more tedious and I had the convenience of flights into Vientiane and out via Luang Prabang, I did not include these in my itinerary, but you can potentially look at 2 days in Xieng Khouang and probably 3 to 4 days in Don Det, if you're using it as a foothold to enter Cambodia through the southern border. 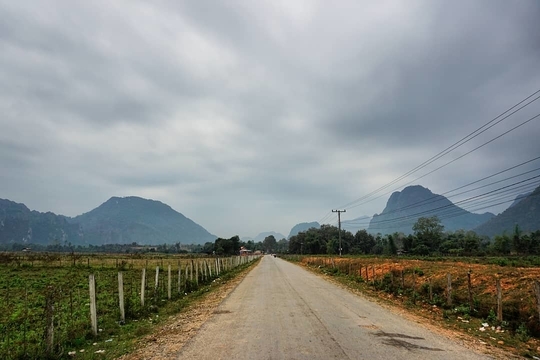 The landscape around vang Vieng is worth exploring. The paddy fields surrounded by small hills are inviting and looks a peaceful get away from city. I would love to see the natural rock formations. I would love to stay for couple of days in Pha Ngeun village for complete relaxation. Hi Yukti, I'm not sure whether tourists will be able to stay overnight in Phone Ngeun Village because there does not seem to be any accommodation options available in the village. Nevertheless, there are hotel and hostel options on the opposite riverbank of the Nam Song across from the town of Vang Vieng which is set amidst the mountains and rice paddy fields, which may appeal to you as an option to escape from the entire party atmosphere of the backpacker town and truly indulge in the tranquil natural surroundings. 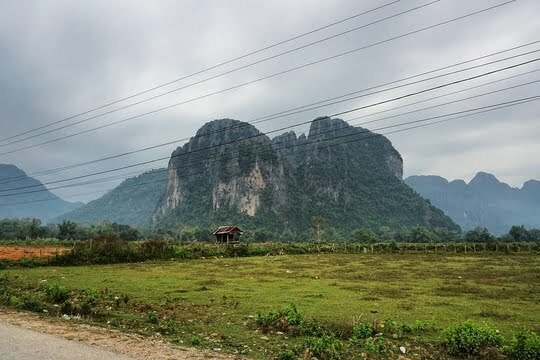 Vang Vieng is indeed blessed with amazing natural landscapes - limestone karsts emerging from the grounds in every direction that one looks in, as well as endless rice paddy fields and lush greenery dotting the entire area. If you've relaxed enough and wish to embark on a more physical activity, there's just so much nature and numerous outdoor activities to embark on - including hiking - that you can enjoy just outside your doorstep as well. 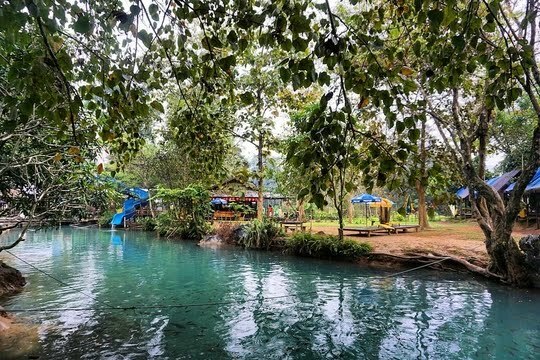 Do check out Vang Vieng, as I'm sure you'll have a ball of a time here! Wow, now I know where I'm going next. I'll be in Vietnam in a few weeks and will definitely check Laos too! Thanks for sharing! 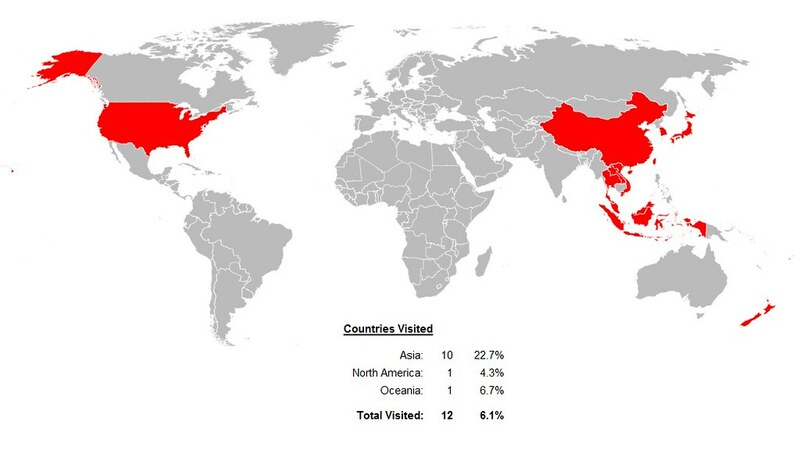 Hi Cato, it's really nice to hear that you're interested to visit this charming country after checking out this post of mine. Laos is oftentimes neglected by backpackers who are visiting the region because it lacks the stereotypical Southeast Asian beaches they long for. However, what the country does not have in terms of its coastline and beach activities, it clearly makes up in numerous facets which will not fail to impress travellers. The country boasts a plethora of beautiful natural landscapes ranging from the north (Vang Vieng) to the south (4,000 Islands) as well as a rich history and culture emanating from the multitudes of temples ('wats') dotting the cities and towns throughout the entire nation. Besides that, the locals I met in this country are extremely friendly and amicable, offering me a very warm welcome to Laos and being very hospitable towards travellers. However, what really impressed me is the truly authentic travel experience where attractions are retained in their primitive, rustic form. I'm sure you'll enjoy yourselves tremendously in this country and bring back lots of memories. Stalactites and Stalagmites look so amazing and I am intrigued to know about their formation. 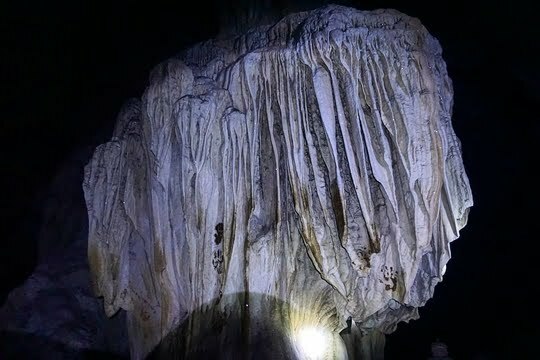 I have been to 3 such caves so far (2 in India and 1 in Vietnam) and would to visit this one. Sad about the vandalism. 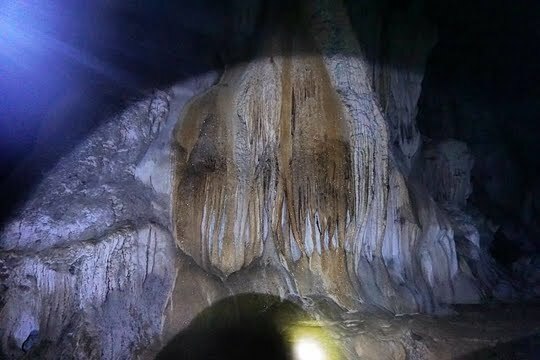 Hey Ketki, Mother Nature creates amazing wonders in magical ways - in the simplest way put, the stalactites and stalagmites are formed by the delivery of minerals such as calcium carbonate brought about by the movement of water and precipitation. 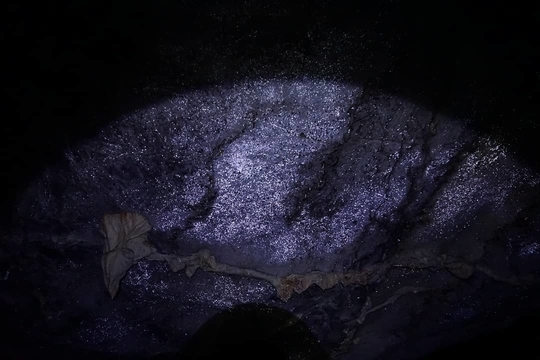 After an extremely long period of time, the minerals are collected in these finger-like projections from the ceilings of the caves and emerging from the ground as well. 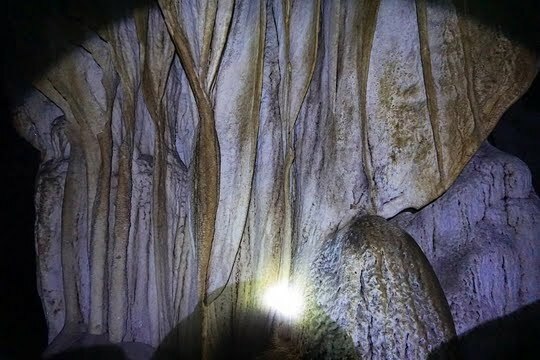 I've visited a couple of caves myself (1 in New Zealand, 1 in South Korea and 1 in Vietnam), but this one in Laos was definitely one of the most unique ones. Besides the fact that it is a holy site highly revered by the locals as a place of worship, the caves are not touted as a popular tourist attraction by the authorities but are rather retained in their most rustic, authentic state without being overly commercialised and pre-packaged unlike many other caves elsewhere which are artificially illuminated and paved. 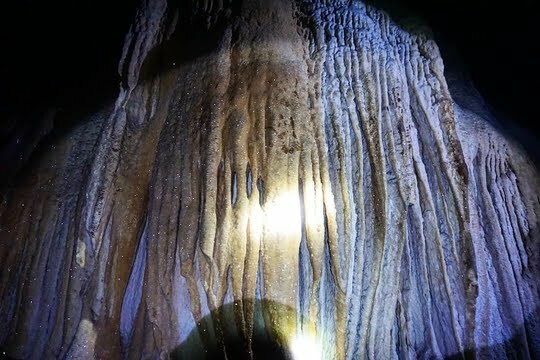 You should definitely check out the Tham Phu Kham Cave! Hi Shaily, I wish I had been able to capture a shot of the renowned golden crabs which the guide has said made this cave such a unique and holy site where locals step forward to do their prayers and make their offerings. Perhaps, it's the bad weather which scared them away to hide in the dark corners of the cave - they're shy creatures, I'm guessing! Nevertheless, the amazing rock structures definitely made the visit worthwhile, as they are certainly like nothing else I have ever seen in my life. 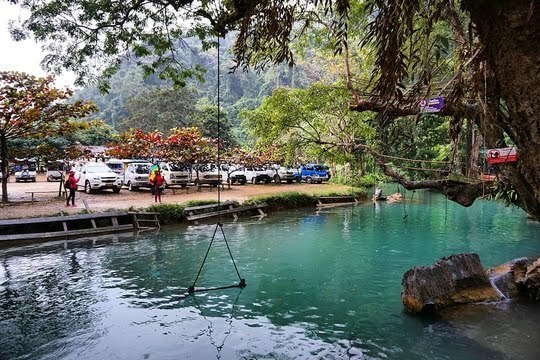 Vang Vieng really has some of the most spectacular natural landscapes and scenic views with gigantic limestone karsts towering over the entire area which is dotted by agricultural plantations and rice paddy fields. 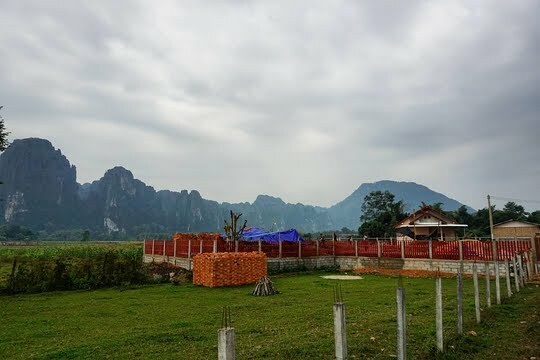 The locals have also capitalised on their prime location to construct vantage points for travellers to admire the scenery from, which contributed to the sprouting of multitudes of viewpoints which visitors will be able to choose from to have different angles and varying aerial views of the entire landscape of Vang Vieng. Plus - walking through the plantations and interacting with the locals living their normal lives in the villages along the way is really an amazing experience. I'm sure you'll love it! Vang Vieng is a great place. We really enjoyed our time there. Hey there, it's nice to know that you enjoyed your visit to Vang Vieng. It is indeed blessed with amazing natural landscapes - limestone karsts emerging from the grounds in every direction that one looks in, as well as endless rice paddy fields and lush greenery dotting the entire area. Many tourists are put off by the excessive party atmosphere perpetuated by the backpackers in the main town centre, but it is definitely worth the stop in this town because there's just so much nature and numerous outdoor activities to embark on - including hiking - that one can enjoy just minutes outside of the town. Glad that you guys made the trip and had a great time! I have always loved the countryside so this looks like a place I would enjoy. I might be a little nervous to jump into the lagoon but it looks so much fun. And the cave looks so beautiful. Laos is definitely on my bucket list for the future. Hi Paula, it's really nice to hear that you're interested to visit this charming country after checking out my post. Laos is often neglected by backpackers who are visiting the region because it lacks the stereotypical Southeast Asian beaches they long for. However, it boasts a plethora of beautiful natural landscapes, a rich history and culture, friendly locals and a truly authentic travel experience where attractions are retained in their primitive, rustic form. I'm sure you'll enjoy yourselves tremendously in this country and bring back lots of memories. No worries about the lagoon, though, as you can simply enjoy a dip in the cooling blue waters to get refreshed and rejuvenate yourself after the long trip out of the town centre to the Blue Lagoon and to cool down from the scorching Southeast Asian heat. Once you feel like you are ready, just head up to the caves where you will not fail to be impressed by the wide range of rock structures just waiting to be explored in the pitch-dark depths of the cave! Wow, we were just in Ninh Binh, Vietnam and some of the photos look really similar! These places all look amazing - I'd love to explore Laos sometime soon. 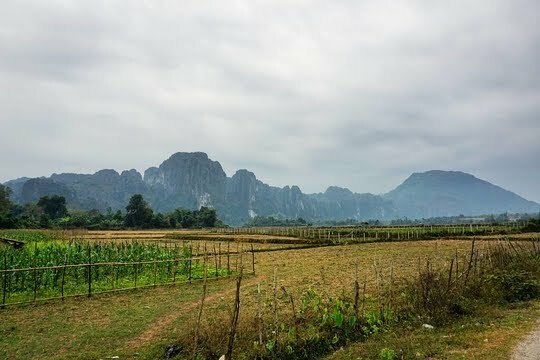 Vang Vieng is indeed blessed with amazing natural landscapes - limestone karsts emerging from the grounds in every direction that one looks in, as well as endless rice paddy fields and lush greenery dotting the entire area. 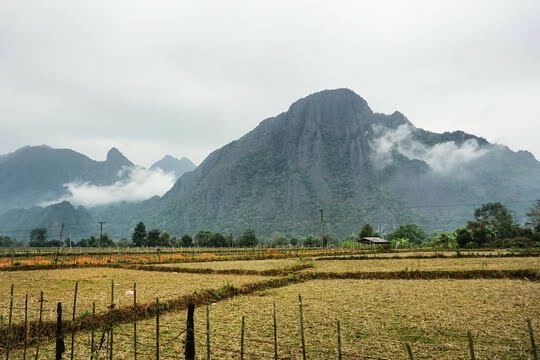 The thought of visiting Laos had never crossed my mind a year ago, but it was seeing the spectacular scenery and views of the mountains and the waters which drove me to impulsively decide on travelling to this country - and I am happy to say that I enjoyed myself tremendously and so I'd highly recommend that you consider visiting this charming country as well! 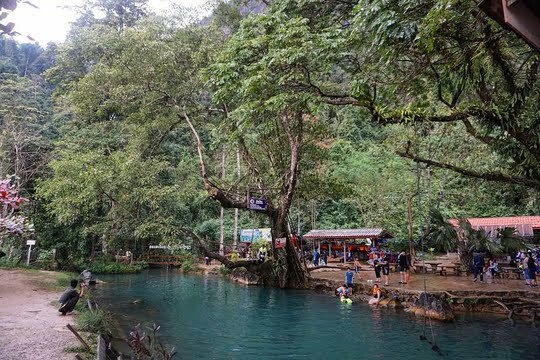 Vang Vieng looks so beautiful in your post. It's really similar to Ninh Binh in Vietnam, but has different things such as the Blue lagoon. Spending time at the Blue lagoon seems really interesting and fun. 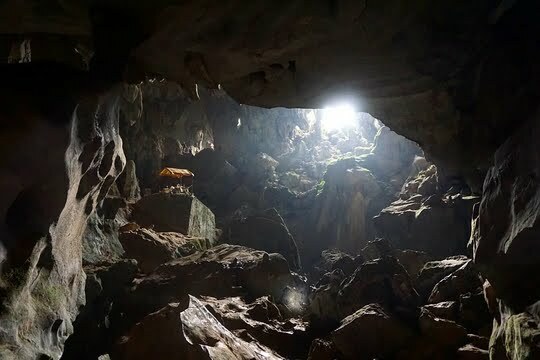 Also, I'd love to visit Tham Phu Kham Cave too. 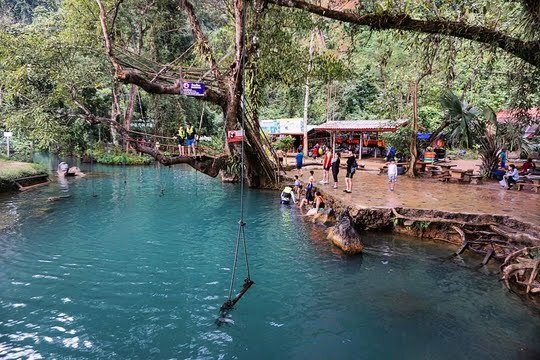 The Blue Lagoon is indeed a great way to unwind and relax after being fried in the scorching Southeast Asian heat, and also offers opportunities to befriend other backpackers while challenging oneself to jump off one of those tree branches and swings. Otherwise, there are always other options waiting for you - simply getting a refreshing dip in the water or heading up to the mysterious caves to admire more rock structures. You should definitely consider visiting Vang Vieng as there's just so much to do here in the countryside! I like the way you say it - there may be free bridges but just pay anyway to help the local economy! Its a really noble and easy way to help the country you're traveling in. Once again, I have the say, the villages look so so so much like Indian villages! The cave looks impressive. The swing on the turquoise water is just the perfect place! Hey Bhusha, that's just my two cents - there's a similar bamboo bridge in Luang Prabang which also requires a meagre toll fee of LAK 2,000 (USD 0.25) to cross, where the funds collected are then used to construct the bridge again the next dry season as the bridge is always being washed away during the rainy season when the water levels rise. Given the convenience of its location being located along the main road to the Blue Lagoon and the efforts put in to maintain it, I'd pay for it to help the locals in this small way of mine. Same goes for the visiting of family-owned viewpoints where the low entrance fees can go a long way in their sustenance. I've been hearing loads about India lately, be it from other travel bloggers or even my favourite travel vloggers who recently visited the country. Now that you said these villages resemble those in the Indian countryside, I'm considering visiting your beautiful country as well as there is really a lot to do there and plenty of sights and sounds to take in from the culturally diverse country with such a rich culture and history just brimming in every corner. 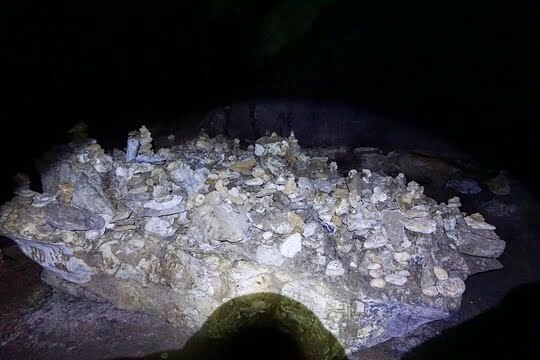 Amazing views inside the cave of the golden crab as well as that of the mountains! This is certainly a place that I shall add on to my bucket list!! Thanks for sharing about this wonderful place!! Hey Claire, thanks for the lovely comment and it's nice to know that you found these attractions and sights I've recommended here to be interesting. 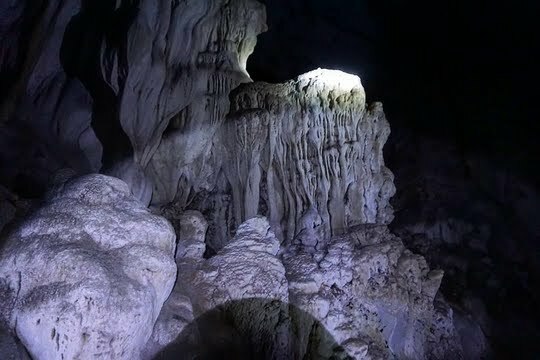 I really enjoyed visiting the Tham Phu Kham Cave because everything in there ranging from the rock structures to even the practice of stacking pebbles on top of one another felt so rustic and untouched that it felt as though I was immersing myself in the local culture and putting myself in the shoes of a local visiting the cave on one of their pilgrimages. Heading this direction soon and you have just added to my excitement! What a beautiful place with so much to see and do, I cannot wait. It looks like you had an amazing time and experience. Your post has given me a few new ideas for our trip. Thanks! 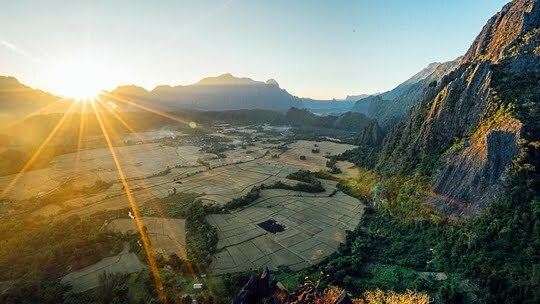 Hey there, I'm so excited for you as Vang Vieng is really one of the most beautiful places which I have ever been to with limestone karsts towering above the land in every direction and endless rice paddy fields and agricultural plantations stretching across the expanse of the landscape. 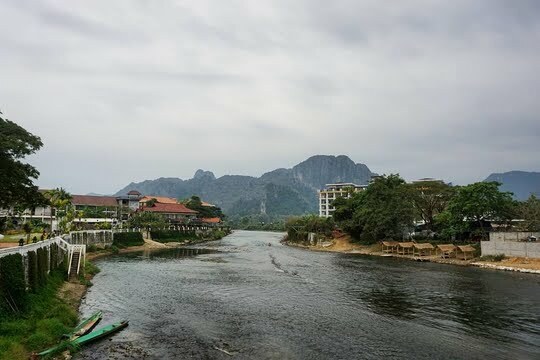 Besides that, there is a wide range of activities that you can embark when in the area, ranging from the famous activity of tubing and kayaking down the Nam Song to hiking to spectacular vantage points sprouting in various villages on the opposite riverbank. There are so many things to do here that I wish I had allocated more time to explore it thoroughly. thanks for sharing us this unique beauty and destination. That Blue lagoon is very inviting and no wonder many like to have a jump. Thumbs up on your travel story. Hi Blair, thank you for your lovely comment. 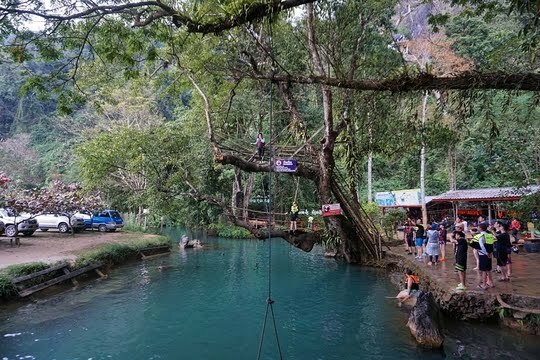 The Blue Lagoon is indeed a great way to unwind and relax after being fried in the scorching Southeast Asian heat, and also offers opportunities to befriend other backpackers while challenging oneself to jump off one of those tree branches and swings. Otherwise, there are always other options waiting for you - simply getting a refreshing dip in the water or heading up to the mysterious caves to admire more rock structures. This part of Vang Vieng is really extraordinary. What a pristine place still unspoiled by commercialization. Loved the pictures of the paddy fields against the backdrop of the mountains, great to walk there breathing in the mountain air. The blue lagoon of course looks so ethereal and finally the rock sculptures and I presume they are all natural are amazing to say the least. This is seems to be a little offbeat non-touristy places to visit. Even I found the lagoon part to be a bit unimpressive but the caves are worth going for. Overall the place looks serene & one giving a local feel. Great Blog! Its really helpful Blogging is an amazing skill with which you can share your thoughts online.Love your ideas keep up the good work! 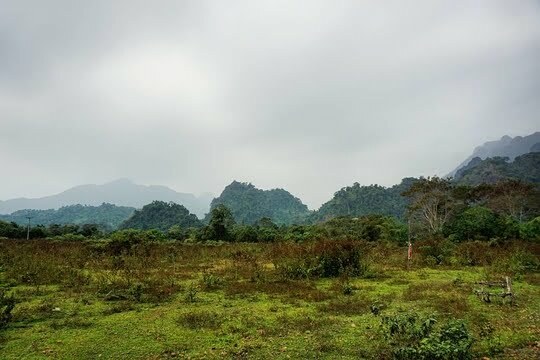 Blessed with a plethora of picturesque natural landscapes in every direction of this little town of Vang Vieng, it is not surprising that numerous vantage points have sprouted along the unpaved paths of the other riverbank, the most famous of which is undoubtedly the Pha Ngeun Viewpoint. However, it was not the views captured from that viewpoint that caught my eye but rather a more obscure one further out in the wilderness which truly amazed me – the Namxay Viewpoint. As Buddhism plays a pivotal role in the society of Laos, it is not surprising to be able to spot numerous temples scattered all over the heart of Vientiane’s city centre. Commonly known as ‘wats’, these temples offer spectacular architecture for visitors to admire and also an opportunity to better comprehend the culture and traditions endeared by the local populace. I'm Nathan from Singapore and I love travelling. Shiok is a uniquely Singaporean interjection to describe pleasure and enjoyment. Here's to more shiok travels! Cheers!